Washington, D.C. — American higher education is risky business for students and taxpayers, and it’s getting riskier. Tuition and fees at public four-year colleges and universities have risen 19 times faster than average family incomes. The investment students and their families make in higher education has become crucial as college degrees are now worth almost twice as much as high school diplomas. In addition, the increased complexity of the college landscape has diminished transparency about student outcomes: programs of study more than quintupled between 1985 and 2010, from 410 to 2,260; and the number of occupations with unique educational requirements tripled to more than 800. To untangle today’s college and career maze, new research from the Georgetown University Center on Education and the Workforce (Georgetown Center), Five Rules of the College and Career Game shows that college is less about what college you go to and what degree you get but more about the returns of individual college programs. Since the 1980s, 60 percent to 70 percent of the increase in earnings inequality has been due to differences in access to college programs with labor market value. About half of Americans (51 percent) would change their degree type, institution or major if they could do it over again, according to the results of a 2017 Gallup Poll. These regrets were influenced by a number of factors, but one was lack of information about a degree and the careers it would lead to. As postsecondary education and training has become the most well-traveled pathway to middle class earnings, students, their families, and educators need to learn five rules in the college and career game. And sometimes those rules are contradictory. Rule 1: More education is usually better — Median earnings increase with each additional level of educational attainment. The median earnings of a high school diploma holder are $36,000, while a BA holder makes $62,000, and a graduate degree holder earns $80,000, on average. Rule 2: Majors matter more — A bachelor’s degree in architecture and engineering leads to median annual earnings of $85,000, almost double the median annual earnings of education majors of $46,000. Rule 3: Majors are important, but they do not control one’s destiny — The top 25 percent of liberal arts majors ($81,000) make more than the bottom 25 percent of architecture and engineering majors ($60,000). Rule 4: Less education can be worth more — Twenty-eight percent of associate’s degree holders, and many workers with one-year certificates, earn more than the average BA holder. 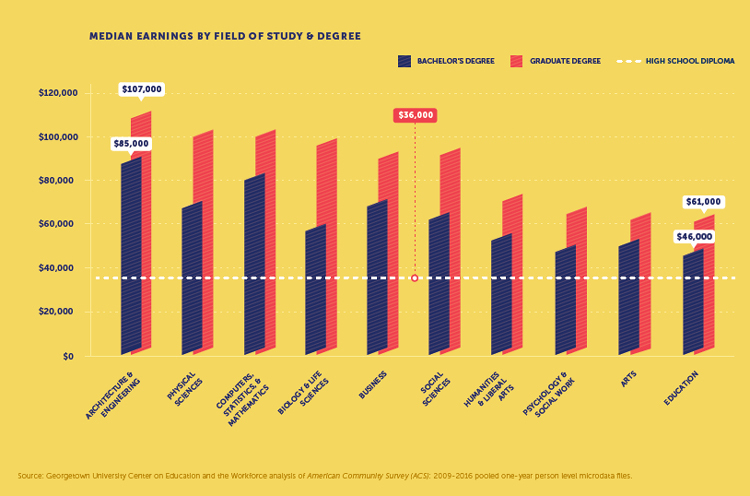 Some bachelor’s degrees holders earn more than the average worker with a graduate degree. Rule 5: Most humanities and liberal arts majors never catch up with the highest earning majors such as STEM, healthcare, and business. Earnings for majors such as business, biology and life sciences, and physical sciences can overtake earnings of social science majors at later ages. Access the full report for Five Rules of the College and Career Game and interactive tool that explores earnings returns of college majors nationally and by state at https://cew.georgetown.edu/5Rules.